There’s a lot of strange stuff floating around the Hudson River, but this just might be the best thing ever spotted in its murky waters. 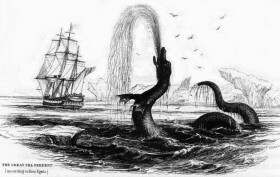 On September 30, 1895, the headline “THINKS HE SAW A SEA SERPENT” made its way into the pages of the New York Times. The article (h/t Gothamist), spoke of a Newark, New Jersey man named Philip N. Jackson who confirmed to reporters that he had indeed seen the same sea monster spotted just a week earlier by a Manhattan resident by the name of Willard P. Shaw. Jackson told the Times that with “his naked eye,” he saw the serpent zipping through the water, at times whipping its 100-foot-long body into the air.